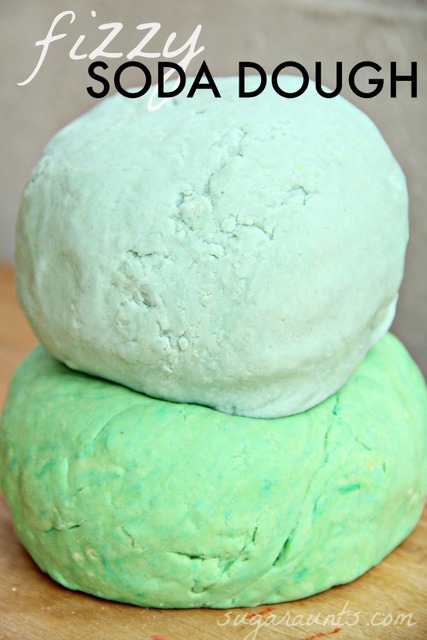 This month's sensory dough is Fizzy Dough! This was a fun one for us, because we combined one of our favorite doughs (baking soda dough!) with sensory science AND cursive handwriting....Whaaaa? Yep! We got them all in here on this post for you, and it was a fizzy blast! 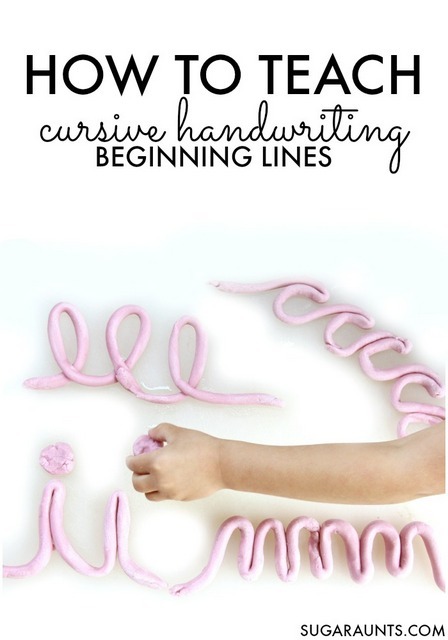 This is a great hands-on activity that can help with the letter formation portion of cursive handwriting. Getting the tactile sensory input can leave a lasting impact on the lines needed to form letters. 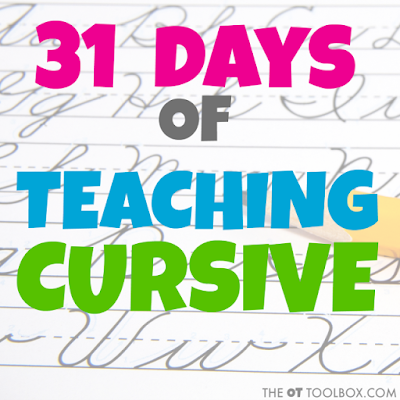 It's a great way to make learning cursive not so boring! 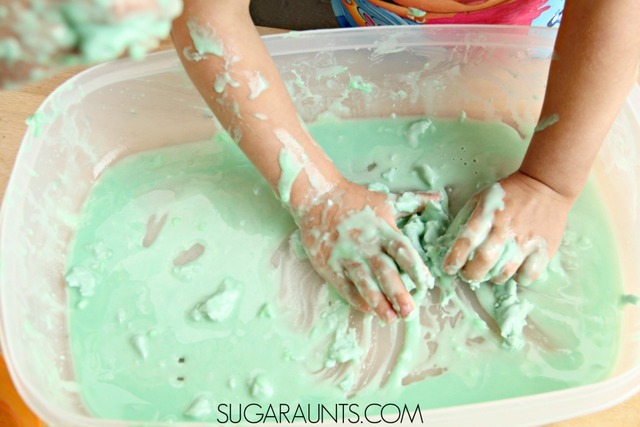 What is Fizzy Dough...was the first thing we thought when we saw this month's sensory dough theme. Apparently anything that fizzes and is moldable can be a fizzy dough. SO, we decided to do a twist on our soda dough recipe. We actually ran out of the corn starch needed for the recipe and added in flour so it became a new soda dough for us. 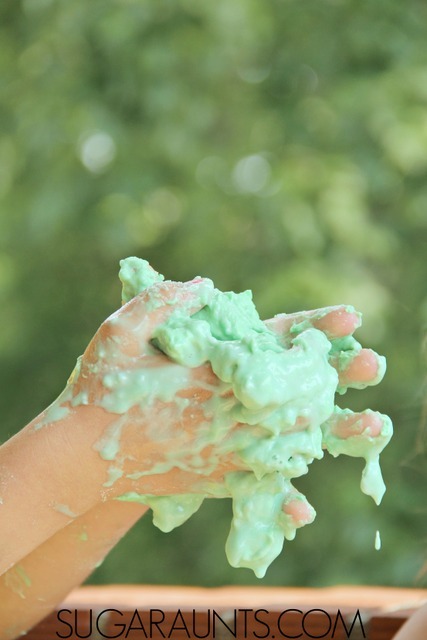 Combine 1 cup flour, 2 cups baking soda, 1 cup water, and a few drops of food coloring in a sauce pan. Cook over medium heat. Stir until it looks like mashed potatoes. Remove from heat and place in a glass bowl. Cover with a cloth until cool. Next comes the fun part: Making the fizzy dough into FIZZY dough! Simply add vinegar for a bubbly reaction that is very fun to watch and play with. We put our dough into a bin and poured and painted vinegar all over the dough. It became a squishy sensory mess of a dough, but still squishy. Add more vinegar for a thinner substance. 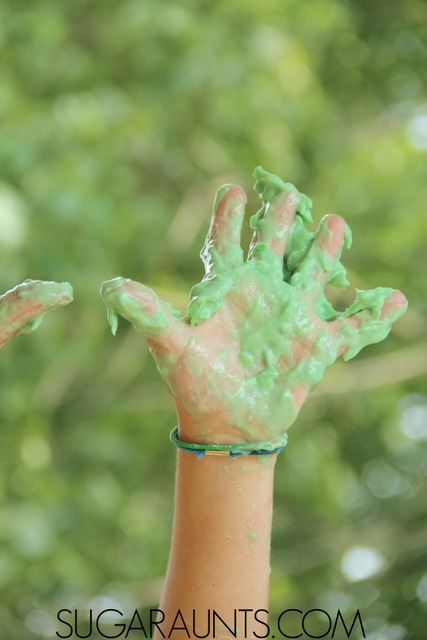 My kids loved squishing it between their fingers. 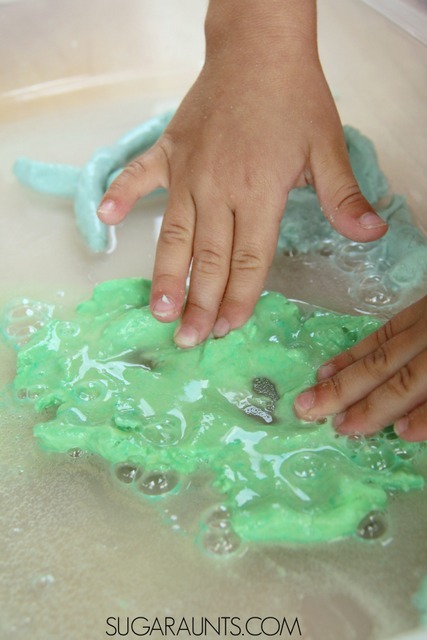 We extended the activity a bit by adding a pre-handwriting and cursive letter formation aspect to our sensory dough. My 5 year old rolled out snakes and made lower case letters. We fizzed them for the sensory fun of it. 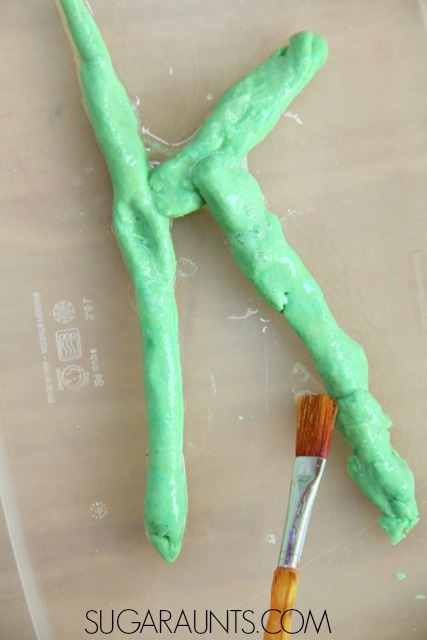 Dip a paintbrush in a cup of vinegar and "paint" the letters for letter formation practice. Be sure to encourage your child to paint the letters in the correct way to practice letter formation and handwriting. When it comes to learning cursive, there is the whole, "Where do I start?" My oldest daughter is asking to learn cursive and I'm excited to teach her. We shared an Instagram post (JOIN us there!) with her latest cursive writing skills. We used our fizzy dough as a starting point to learn the beginning lines and curves of cursive handsriting. Learning the letters can be easy for kids, but the connecting lines can be a bit confusing for kids who are used to printing words. 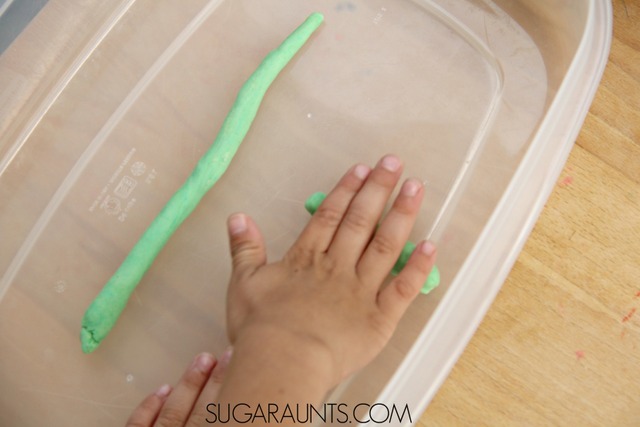 Form a long "snake" with the fizzy dough by rolling it on a table surface. 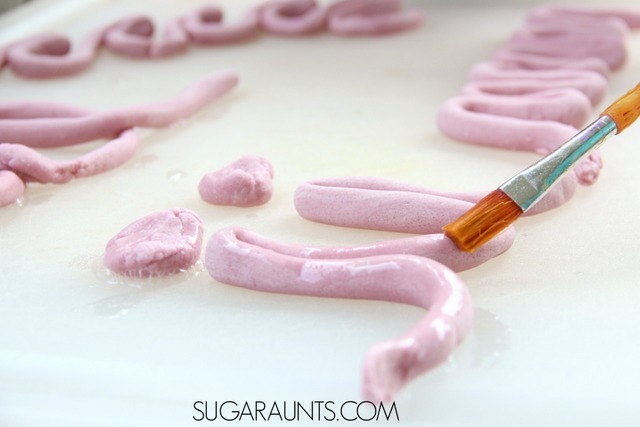 You want the "snake" of dough to be long enough to form several cursive letters in a row. Use the dough to form beginning cursive strokes: a series of lower case letter "i", letter "t", letter "m", letter "l", letter "c", and letter "u". Connect the letters like we did in the picture above to allow the child to get a handle on the flow of the cursive letter lines. You can draw a line on paper or wax paper to make a form for the child to place the dough over. Then add vinegar for a fizzy and sensory reaction. 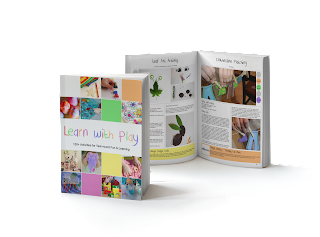 They will love to see their cursive letter lines fizz and the sensory fun of learning cursive handwriting. Then use a paintbrush to dip and paint the cursive letters and cursive forms with vinegar for a fizzy, sensory reaction.